Millie: Millie was President George H. W. Bush's springer spaniel, who's arguably the most famous dog to ever scamper on the White House lawn. Millie is the first presidential pet to write a dogobiography about life in the White House, where she gave birth to six puppies and sat in during the first lady's children's book readings. Although Millie died of pneumonia in 1997 at the age of 12, her legend continues to live on with a commemorative dog park named after her in Houston. 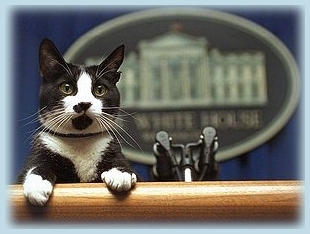 Socks: Socks the cat belonged to President Bill Clinton and his family. The friendly feline was rescued by Chelsea Clinton in Arkansas and lived in the governor's mansion before making the move to the White House. Socks was known for being as cool as a cucumber, and even tolerant of Buddy, the family's brown Labrador retriever. Socks was often seen sleeping in a blue striped chair next to Betty Currie, Clinton's personal secretary and future owner. When the Clintons left the White House, Currie became Socks' new owner and she kept him at her house in Hollywood, Maryland. In 2009, Socks was put to sleep because he was suffering from throat cancer and was believed to be about 20 years old. Laddie Boy: Laddie Boy, an Airedale terrier, owned by President Warren Harding was quite a famous presidential pooch. Laddie Boy loved to fetch, especially when Harding played golf and hit a tree where Laddie Boy could sniff it out. The beloved dog even had his own hand-carved chair for sitting in on cabinet meetings, and newspapers ran mock interviews with the dog. The President and Laddie Boy were so close that the pooch supposedly howled nonstop for three days before his master's death in a San Francisco hotel. Today, President Harding and his prized pup are celebrated with a statue of Laddie Boy made from approximately 19,134 melted pennies, which resides in the Smithsonian Institution. Rex: Rex was President Ronald Reagan and Nancy's Cavalier King Charles Spaniel, who became a fun-loving symbol for the Reagan presidency. The adorable pup was given to the President by conservative commentator William F. Buckley, Jr., and then given as a Christmas present to Nancy in 1985. Rex is named after Rex Scouten, a former White House Chief Usher, who retired during Reagan's presidency. Rex received some national attention when he helped to throw the switch that lit the National Christmas Tree, but was best known for being a pampered pooch, who had a customized doghouse with curtains and framed portraits of the Reagans. Rex also played a major role in the popularization of the breed in America. In his later life, Rex developed an enlarged heart and was euthanized at 13 years old. Barney: Barney is President George W. Bush and Laura's Scottish terrier, who was best known as the "First Dog." The handsome black terrier could be seen playing with volleyballs, soccer balls and golf balls around the White House lawn, and enjoyed watching horseshoes games. Barney is even an accomplished actor, making his appearance in several Barneycam films that were produced by the White House Staff. The presidential pup got a surprise in 2005, when Miss Beazley, another Scottish terrier and Barney's niece, joined the Bush family. Today, Barney is 10 years old and kicking back with Miss Beazley and the Bushes in Texas. Him and Her: President Lyndon B. Johnson's brother-sister beagles, Him and Her, were some of the most memorable White House dogs. The pair loved to play with their master on the White House lawn and go on walks while Johnson talked with the press. Johnson received a great deal of flack when he was photographed lifting Him by the ears in front of a group. Him was the father of a litter of puppies and Johnson's daughter, Luci, kept two of them. Sadly, Her died in 1965 at the White House after swallowing a stone, and Him dies in 1966 after being hit by a car while chasing a squirrel. Checkers: Checkers was President Richard Nixon's American cocker spaniel, who was given to the family by a Texas supporter who read that the president's daughters wanted a dog. But it wasn't just the cute and cuddly face of Checkers that made her an iconic presidential pet, but rather Nixon's famous "Checkers Speech." When Nixon was running for vice president on Dwight Eisenhower's presidential ticket, he was being questioned about his use of campaign donations. In order to remain on the ticket and save his then clean record, he made a television address to defend himself, making sure to note that the one gift he won't give back is the family cocker spaniel, Checkers. Checkers has been credited for saving the politician's public appearance and keeping him on the ticket. Liberty: Liberty was President Gerald Ford's golden retriever, who was given to him by his daughter Susan Ford. Liberty was a lively dog and often photographed with her master at the swimming pool, in the Oval Office and at Camp David. The registered purebred gave birth to a litter of puppies at the White House and the family kept one of them, named Misty. It was even said that Ford used Liberty to end conversations and distract guests by wagging her tail to be petted. Macaroni: Macaroni was President John F. Kennedy and the family's pony. Macaroni was a gift from Lyndon Johnson to Caroline Kennedy when she was five years old. Despite the fact that JFK was severely allergic to animal hair of any kind, he still encouraged his family to ride horses and own animals. The precious pony would sometimes roam freely on the White House grounds, but mostly lived on a farm in Virginia with the rest of the Kennedy's horses. Tiger (Tige): Tiger, also known as Tige, was one of President Calvin Coolidge's cats who lived in the White House. Tige was an alley cat and Coolidge enjoyed wearing him around his neck. He was known for exploring the White House grounds, even escaping all the way to the Lincoln memorial. It wasn't long after that when Tige disappeared from the White House and never returned.